Villa San Bartolomeo. 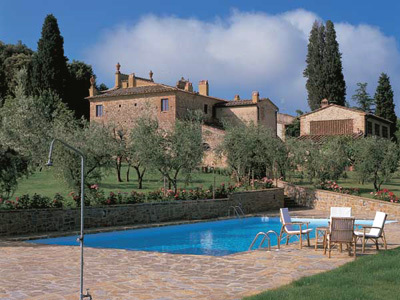 The Villa is located in the Chianti hills, on a ridge that overlooks a valley rich with history. The Villa originally belonged to the noble Sernigi family, who were rich merchants and patrons of the great 15th century artists. The Villa later passed into the hands of the Naldini del Riccio family. During the 18th century the residence degenerated into an ordinary farmhouse. At the end of the 1950’s the house was purchased by the Corti Family who restored the Villa to its original splendour. The restoration not only maintained the original structural elements of the Villa but also enhanced the natural harmony that ties this structure to the Tuscan countryside. All the Villa’s arches, windows and doorways are true to the original structure of the house. Depending on your group size, guests can also choose to rent the Guesthouse of the Villa. The Guesthouse is found just a few metres from the main Villa, and it can accommodate up to 6 additional people. The Villa lies in the small village of Palazzuolo and is surrounded by olive groves, flowering bushes and fields of Mediterranean plants. It has a large swimming pool and courtyards which are ideal for relaxing outside in the fresh country air. Not far away there are tennis courts and horse riding stables. There are also trekking paths and mountain bikes for those who want to explore the beautiful surrounding scenery. The Villa is located in the Chianti hills, on a ridge that overlooks a valley that is rich with history. Is is in the ancient village of Palazzuolo. Not far away there are tennis courts and horse riding stables. There are also trekking paths and mountain bikes for those who want to explore the beautiful surrounding scenery. Low Season: All other months.